Kamehameha Schools’ announces 11 Hawai‘i businesses who will join Hale‘iwa Store Lots (HSL) upon completion in fall 2014. A historical reference to the site’s original name – Waialua Store Lots – Hale‘iwa Store Lots will preserve and retain the rural character of Hale‘iwa Town by merging old and new in a cohesive, safe, and historically authentic way. With 27,000 square feet of gross leasable space, Hale‘iwa Store Lots will share Hale‘iwa’s history of people and place through plantation-era buildings, sustain Hawai‘i-owned retail and dining businesses, and ensure long-term viability of this special place. To read the full release, click here. Kamehameha Schools is excited to collaborate with members of the North Shore community to offer “E Ala E” cultural tours and demonstrations starting this Saturday, December 31st. The free event takes place next to Aoki’s Shave Ice and is open to the public every last Saturday of the month preceding the Hale`iwa Art Walk from 5-9 pm. For more information, click here. Bordered by the ‘Ili‘ohu subdivision and Waimea Bay, the proposed Kāpaeloa Cultural Learning Project will support the KS North Shore regional plan and projects including Loko Ea fishpond, ‘Uko‘a marsh, Kupopolo Heiau. The proposed facilities will include an outdoor activity lawn, pavilion, dormitory structures, caretaker’s residences, a native plant garden, off-street parking, and support infrastructure. The Kamehameha Schools Kāpaeloa Cultural Learning Project site is located on approximately 3.48 acres and will serve as a venue for Kamehameha Schools’ community stewardship programs. As part of the North Shore Planning process and the desire to consult with the residents of the ‘Ili‘ohu subdivision who will be most impacted by this project, Kamehameha Schools has conducted numerous community meetings in order to gain community input and support of the Kāpaeloa Cultural Learning Project and its proposed plans. The community has been supportive of these plans thus far and will continually be updated as plans progress. 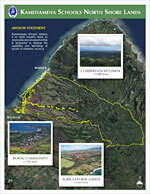 To view the Kāpaeloa Cultural Learning Project Environmental Assessment, click here. Kamehameha Schools is perpetual trust with roots in the community and is committed to being a good land steward and responsible developer in a manner that supports the community’s vision to retain and enhance Hale‘iwa’s historic country character. 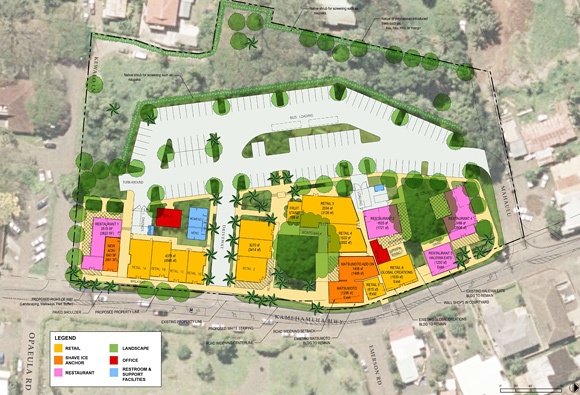 In alignment with the City & County’s North Shore Sustainable Community Plan objectives and the Hale‘iwa Special District guidelines, the Kamehameha Schools Hale‘iwa Commercial Redevelopment project will feature a central gathering place, shaded courtyards and walking pathways to address safety concerns all the while preserving the rural main street character of historic Hale‘iwa Town. To view the Draft Environmental Assessment for this project, click here. To view Frequently Asked Questions (FAQs), click here. The North Shore Master Plan was completed in March 2008 after significant input and consultation with the community and public agencies. The plan calls for the implementation of seven catalyst projects which address the desire to increase natural and culture resource stewardship and management; expand educational opportunities; establish alternative energy uses; enhance diversified agriculture and food production; develop and redevelop rural commercial and rural residential areas.